Geldof is a leading European supplier with global references for storage tank projects for oil, petrochemicals and biochemicals, and other bulk liquids. The storage tank solutions range from the delivery of individual storage tanks to the erection of large and fully equipped storage tank terminals, as well as everything in between. Geldof also offers comprehensive programs for tank maintenance. Geldof has a proud track record in the engineering and site erection of storage tanks and over the years has grown into a full scope solutions provider for the implementation of turnkey tank terminals, including civil works, tank construction, piping, electrical and instrumentation systems, etc. Volumes of individual tanks vary from very small to over 100,000 m³, and the total capacity of a terminal built by Geldof can reach over 1,000,000 m³. Each technical solution is individually conceived and engineered in house in order to optimally meet the application’s requirements, the project’s challenges and the customer’s expectations. Tanks are designed according to EN12285, EN14015, EN14620, API620, API650, CODRES and DIN4119 codes and standards. Steel plates and subassemblies are prepared in our fabrication area, which is fully equipped to handle carbon steel, stainless steel, duplex steel and special materials. Our highly competent project management and powerful site organization, equipped with the most advanced erection and assembly tools, can also be strengthened by strategic partnerships and local subcontractors. Geldof is capable of fabricating large storage tanks off-site, from where they are shipped for installation at the customer’s site. The technical solution for each tank is individually conceived and engineered in house in order to optimally meet the application’s requirements, the project’s challenges and the customer’s expectations. Tanks are designed according to EN12285, EN14015, EN14620, API620, API650, CODRES and DIN4119 codes and standards. The fabrication area is fully equipped to handle carbon steel, stainless steel, duplex steel and special materials. 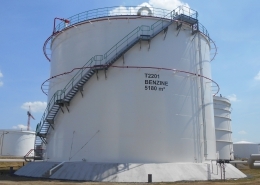 Volumes of our off-site built tanks vary from 10 to about 8,000 m³. 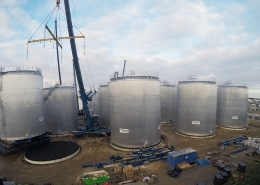 Larger tanks are always erected on-site. Whether painted, polished or pickled and passivated, Geldof always offers a perfect finish. 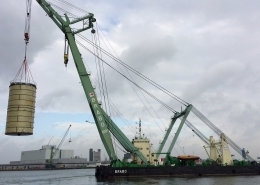 The facility is located along major waterways with access to seaports and equipped with all necessary means of transport, quays and facilities, allowing shipment worldwide. 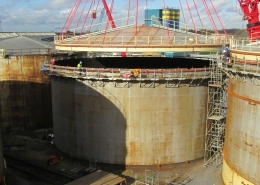 Geldof’s off-site built storage tanks can be installed fully dressed, including insulation, ladders, platforms and ancillary appendages at their final location at the customer’s site. Geldof offers project-based and contract-based tank repair and maintenance solutions, ranging from advisory services to all the standard mechanical, civil, electrical and environmental tasks all according to EEMUA 159, API653 or other norms and standards.